It’s been 10 years since the William & Mary Green Fee was first established at William & Mary. 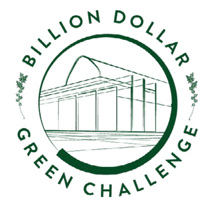 Since spring 2008, the Green Fee program has funded more than $1 million worth of sustainability projects led by W&M students, faculty and staff, representing different aspects of sustainability on campus. The student Green Fee program accepts proposals every semester, aiming to raise sustainability awareness and promote sustainable living on campus, as well as enhancing community outreach and sustainability initiatives in facilities and operations. From campus-wide initiatives to student-faculty research, the W&M Committee on Sustainability (COS) has awarded seven proposals this fall, dedicating a total of $42,396 to sustainability projects. Some of the highlights this semester include: the installation of Solar Powered Charging Station at W&M’s Virginia Institute of Marine Science and an increase in composting initiatives for Residence Life, Branch Out Alternative Breaks and KelRae Farm. W&M Sustainability also recently launched a Sustainability Plan covering fiscal years 2019-2024. One of the goals of the plan is to grow the Green to Gold Fund, a green revolving fund, to $1 million by 2025. The Green to Gold Fund provides loans to departments for cost-saving projects that reduce greenhouse-gas emissions or resource use. It is a complementary fund to the student Green Fee program, which provides grants each semester to students, faculty and staff for environmental, social and economic sustainability efforts. The Cohen Career Center has a vibrant and visible atrium. Unfortunately, solar energy passing through the glass panels causes the temperatures to elevate in the summer months creating additional load on the building cooling system. A window film solution was chosen that maintains the visual appearance of the building while reducing solar energy transfer by 58 percent. This high quality product comes with a 15 year warranty. Reducing unnecessary cooling load will translate to lower energy consumption and reduced greenhouse gas emission reduction. Commons Dining has multiple exhaust fans that draw air out of the building and that must be replaced with conditioned outside air. The crude control of the existing HVAC system will be enhanced to reducing excess outside air being brought into the building, thereby reducing energy consumption. Reducing unnecessary outside air in this exhaust-intensive building will provide both energy savings and greenhouse gas emission reductions. Residence Life at William & Mary is a strong source of community development, and one way that community development is attained is through events with food. In an effort to make these events more eco-friendly, the Center for Community Development — a large resource center — will be stocked with compostable plates, utensils, cups and trash bags, for resident assistants to pick up and use in their initiatives. Should the compostable supplies be widely used as a replacement to their disposable equivalents, there would be an overall decrease in the amount of resources to produce them. Additionally, should the compostable supplies be taken to Residence Life’s partner compost facility afterward, they would decompose in a much more healthful way than disposable supplies would in a landfill. Should this pilot project be successful, compost-related efforts will hopefully proliferate within the residence halls and other similar community development events. This year, Branch Out will purchase portable compost bins to make its alternative breaks even more environmentally friendly and to demonstrate to participants how to compost — a skill which they can take back to their own homes and communities. These compost bins will allow site leaders and participants to minimize any negative environmental impacts they may have on the communities they enter. Although Branch Out emphasizes sustainability already on its breaks in asking participants to waste as little food as possible, the program recognizes that food waste will almost always occur. Thus, composting is one way in which the program is striving to encourage a waste-conscious practices on alternative breaks. These portable compost bins will allow the program to continue to replace some of its most wasteful practices with more environmentally conscious ones. The sustainable dining interns will incorporate mushroom compost into the rows they oversee at Kelrae Farm, in an effort to increase sustainability in the rows. Produce will be grown and harvested on the rows and brought to the dining halls as part of their goal to increase organic and sustainable farming practices in the food that the student body consumes. In collaboration with William & Mary’s Committee on Sustainability, VIMS is continuing to expand the accessibility of renewable and sustainable energy sources on its campus. Through the use of this solar-powered charging and work station, students, employees and visitors will be able to congregate and charge their electronics (through USB, wireless and standard outlets) on the beautiful, water-front VIMS campus. Along with supporting a healthy work environment, the table can be used during outreach and public events on the VIMS campus to promote the benefits of sustainable living. The addition of this outdoor table to the VIMS campus will raise awareness on sustainable energy sources and contribute to VIMS’ goal of sustainable and renewable energy. To increase the number of breeding waterfowl on Lake Matoaka, the grant will fund the construction and implementation of five wood-duck nesting boxes in suitable areas around the lake. Wood ducks are reliant on the availability of pre-existing cavities where they construct a nest out of their own down feathers. One of the five nesting boxes will be equipped with a live-stream camera on the interior of the nesting box to document and monitor the behavior of the hen and her clutch after they hatch and subsequently leave the nest for good. 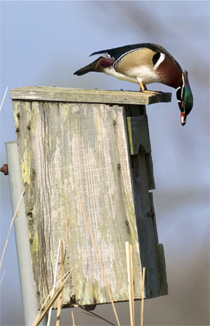 Nesting boxes will be spaced out and placed accordingly around areas of the lake where shelter from predators and forage is plentiful. Once installed, nesting boxes will provide optimal habitat for breeding wood ducks on the edge of campus for years to come.